The aquarium is huge and very interesting. Well worth the time and money. Recommend anyone attending the Aquarium to get there right on opening as starts to get incredibly busy from 11am. The optional transport will get you there with time to spare. The Aquarium itself is incredible. The size of the exhibits are jaw dropping! I could have spent all day there quite happily sitting watching the sea life do their thing all day. Whilst we enjoyed the Aquarium, I don't think we would go again. It wasn't quite what we were expecting, I think we expected to see dolphins but could hardly see them in their tank. The aquariums are spotlessly clean and the wildlife amazing, the large aquariums were breathtaking, especially being able to see the schools of fish swimming around. It was however very noisy as there was a lot of children screaming which seemed to echo off the walls. 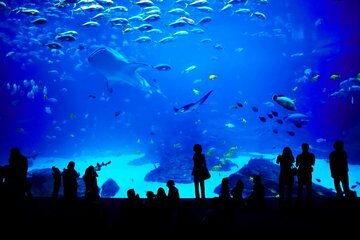 I booked admission tickets without hotel transport.We went to travel agent office from Airport via taxi.It was very easy.Agent was so helpful and friendly.My children had so much fun in SEA Aquarium. Amazing Aquarium kids loved it defiantly a must see. The pick up from the hotel was prompt, and we really enjoyed the Aquarium - it was good to arrive early as it was getting very busy when we left late morning. We combined the visit with a stop for some lunch and a look at the casino. Fabulous. Found the ticket desk in the underground coach station fairly easily. The ticket desk didn't open until 1000 so no need to get their early in the hope that they might get you the ticket sooner. Aquarium is wonderful, I have been to a few aquariums and this one didn't disappoint. even saw some things that I've not seen elsewhere. Getting to the aquarium doesn't need to cost the earth. To get there from the airport I took the MRT, so easy, and then I walked along the boardwalk. only taking about 10-20 mins depending on how quick you walk and it is undercover and their are travellators. You will see the signs for the coach park as you come off the boardwalk.